Iowa features an extensive surface transportation system, with more than 110,000 miles of roadway, most of which is under the jurisdiction of local agencies. Given that Iowa is a lower-population state, most of this mileage is located in rural areas that exhibit low traffic volumes of less than 400 vehicles per day. However, these low-volume rural roads also account for about half of all recorded traffic crashes in Iowa, including a high percentage of fatal and major injury crashes. This study was undertaken to examine these crashes, identify major contributing causes, and develop low-cost strategies for reducing the incidence of these crashes. Iowa?s extensive crash and roadway system databases were utilized to obtain needed data. Using descriptive statistics, a test of proportions, and crash modeling, various classes of rural secondary roads were compared to similar state of Iowa controlled roads in crash frequency, severity, density, and rate for numerous selected factors that could contribute to crashes. 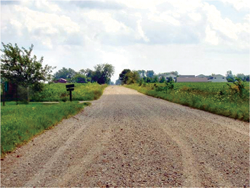 The results of this study allowed the drawing of conclusions as to common contributing factors for crashes on low-volume rural roads, both paved and unpaved. Due to identified higher crash statistics, particular interest was drawn to unpaved rural roads with traffic volumes greater than 100 vehicles per day. Recommendations for addressing these crashes with low-cost mitigation are also included. Because of the isolated nature of traffic crashes on low-volume roads, a systemic or mass action approach to safety mitigation was recommended for an identified subset of the entire system. In addition, future development of a reliable crash prediction model is described.